You have the right to forgive yourself anytime you want. In every single person's life lies a mistake made by a person that they wish they could take back, whether they are ready to admit it or not. The only way to move past the regret of a mistake in our lives that still causes us pain is to forgive yourself for it. Not only is it our right to, but forgiving our selves allows us to move past obstacles in our lives that we would not have otherwise moved past without doing so. 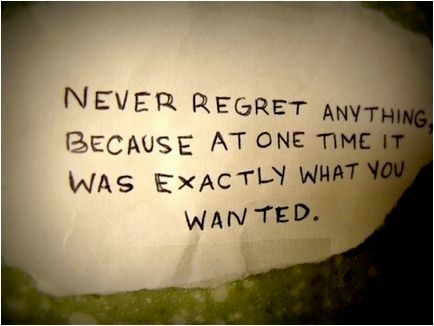 Never regret anything because at one time it was exactly what you wanted. 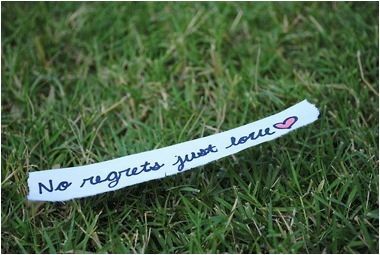 Living life with regrets is in a sense, not really living life. Picture yourself trying to drive somewhere. Do you think that you would be able to make it safely from point a to point b by staring into the rearview mirror the whole drive? Of course not! We must use this as an example to the way we live our lives. 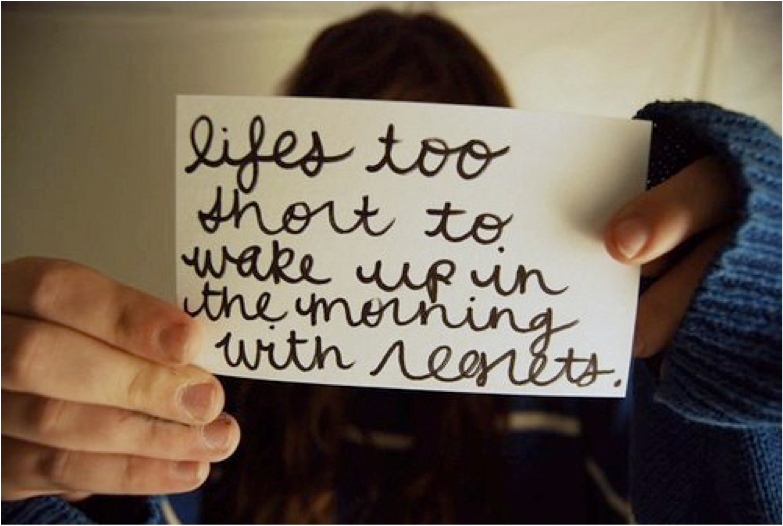 Life's too short to wake up in the morning with regrets. None of us want to be the type of person that lives everyday thinking of what could have been, and thinking of the things that we wish that we would have done. Life is too short to always be thinking should've, would've could've. Today is the day where you start your future, and the day that you live life with no regrets. It is perfectly okay to think things over, but sometimes you just have to take life as it comes by. As we go through relationships sometimes they fail, and sometimes they last forever. In order to love fully, and in order to love effectively we must love without worrying about regretting how it may make us feel later on in life. Some of us choose to put up walls and try to pursue relationships with another person halfheartedly. Trying to keep a relationship afloat with only half of a heart in it, is comparable to trying to live with only half of a heart, pretty much impossible to do. On top of that, would you want someone to only love you with half of themselves when you know that you are giving them your all? You surely wouldn't. Sometimes we just have to kick back, and let all of our walls protecting our hearts down, and choose to love someone when we know deep inside that it is right for us.